Britannia - Almost 2,000 Years Old! Britain was known to the Romans as Britain or Britannia well before the brief visit by Julius Caesar in 55 BC. They regarded it as the "end of the world". Julius Caesar made a second visit to Britain the next year. Neither of these visits, both of which were restricted to Kent, had any great or lasting effect on the inhabitants. Caligula also had an even briefer visit to Britain in 41 AD, which has been described as a "mock invasion", and "too ridiculous" to be regarded as an invasion. In 43 AD, Claudius began a serious attempt to invade, sending his general Aulus Plautius. Once a number of battles had been won, Claudius himself visited for a period of sixteen days, for which he became recognised as the triumphant conqueror of Britain. Several triumphal arches are believed to have been erected honouring this achievement, including one on the Palatine hill. He was also honoured by being given the surname Britannicus, which also passed to his sons. The arch mentioned above is portrayed on a number of gold and silver coins of Claudius. It features an equestrian statue atop the arch, undoubtedly representing Claudius, between two trophies, a trophy being a pile of captured shields, spears, armour and other spoils of war. On the architrave of the arch is inscribed "DE BRITAN", "DE BRITANN", "DE BRITANNI", or "DE BRITANNIS", depending on the space available. There is a gold aureus of this type which was issued in 46 to 47 AD, and a similar silver denarius issued in 49 to 50 AD. 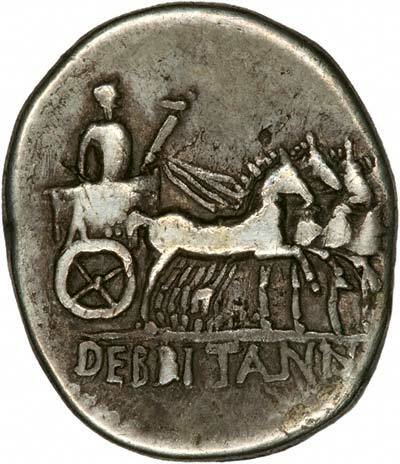 A silver didrachm (2 drachma piece) issued in 46 to 48 AD shows Claudius in a quadriga (four horse-powered chariot) with the inscription "DE BRITANNIS" below. Tiberius Claudius Britannicus was a son of Claudius, and inherited his father's surname, which had been awarded to him as the conqueror of Britain. Apart from his surname, no coins of Britannicus bear any reference to Britain or Britannia. There were no further mentions of Britain on Roman coins until the time of Hadrian, who is of course famous in Britain for his wall, much of which still stands today. It was originally built to keep the warlike and aggressive Scots out of England, but its effectiveness has diminished with time. Nowadays whole coachloads of Scots, particularly from Glasgow maintain a traditional annual invasion of England, particularly Blackpool where we are based, for "Glasgow Fortnight" usually during July. Much alcohol is consumed, traditional highland dress is worn, many ice-creams eaten, and many battles against the English "The Auld Enemy" are re-enacted, often with alarming realism. Hadrian visited Britain in 121 AD, greatly increased the Roman influence in Britain, and strengthened Roman garrisons and fortifications here. He failed, as did following Roman emperors, to subdue the Scots. Under Hadrian, a shrine was erected in York, to Britannia as a Goddess. There were many coin types, also medals, issued under Hadrian which incorporated the mention of Britain. In particular, several coin type introduced a female figure, the personification of Britain, and labelled "BRITANNIA". She is usually shown seated on a rock, holding a spear, and with a spiked shield propped beside her. Sometimes she is shown holding a standard, and leaning on the shield. On other coins, she is shown seated on a globe above waves, presumably signifying the Roman idea of Britain as being at the edge of the known world. Similar coin types were also issued by Antoninus Pius, 138 - 161 AD, who carried out some repair work to Hadrian's wall. Commodus, 177 - 192 AD issued a number of Britannia coin types. Geta 209 - 212 issued coins mentioning victory over Britain featuring Victory as their reverse type, and also Victory and Britannia standing facing each other, Britannia with her hands tied in defeat. Carausius 287 to 293, issued an antoninianus with the legend GENIO BRITANNI around the figure of Genius. Although today's figure of Britannia is undoubtedly female, on some of the Roman coins, a male figure is shown. On other Roman coins, it is uncertain whether the figure is male or female. 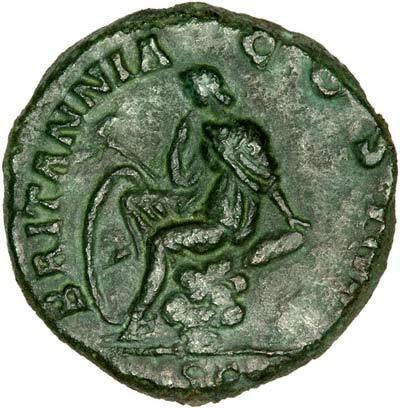 The figure of Britannia did not appear on any future Roman coin issues, although Roman coins were produced in Britain from the reign of Carausius, 287 - 293 AD. It was in 410 AD that the Emperor Honorius advised the British to arrange for their own defence, and Roman influence in Britain declined. Britannia was not seen again on coins for well over a thousand years. We want to buy any Roman coins featuring Britannia, particularly in better grades, so that we can display better photographs on this page.